Florida Fishing is one of the best outdoor activities you can experience when living or traveling here. 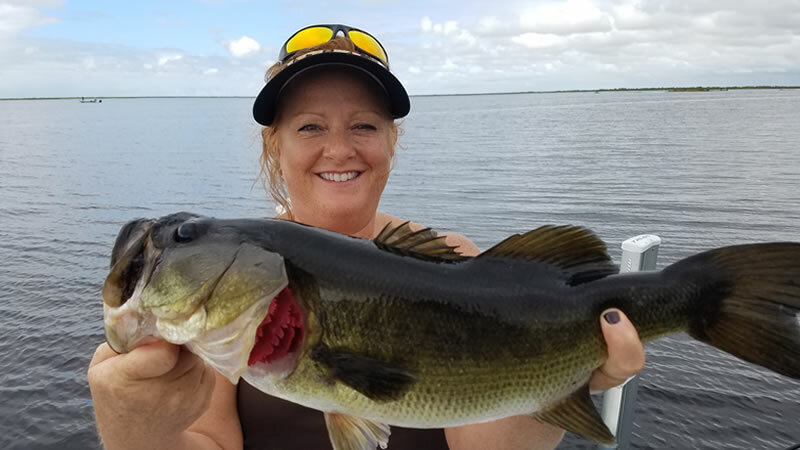 A great Okeechobee City Fishing Experience can help you fall in love with largemouth bass fishing on Lake Okeechobee. I had the pleasure of fishing with Tammy Sue and her husband Tony. They were traveling from Fort Pierce for some of this Lake Okeechobee Bass Fishing action. We launched out of the North End of the lake at Garrads bait and tackle. It was a slow bite to start the day. The full moon definitely played to that bite being slow. After moving around a bit to multiple different spots, we came up to a decent little pocket holding fish. Tammy Sue and Tony were excited to put 20 fish in the boat on their short trip out. The biggest largemouth bass weighed 4.5 pounds. Tammy Sue caught most of the fish and was excited to do so. According to Tony, this is what normally happens. I am looking forward to fishing with them again in the future. They truly were great people to fish with. Next time, we will create more and new memories, one fish at a time.